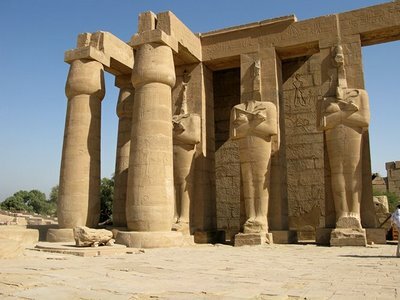 The Ramesseum is the name which was given in the last century to the temple complex built by Ramses 11 between the desert and the village of Gurnah. Diodorus of Sicily himself was amazed at the complexity and architectonic grandeur of the monument. Unfortunately today only a few ruins remain. On the facade of the hypostyle hall one can still see the pillars with, abutting into them, statues of the pharaoh in the guise of Osiris (for this reason they are called Osiriac pillars) and, lying there like a fallen giant, the remains of the syenite statue of Ramses II sitting on his throne. 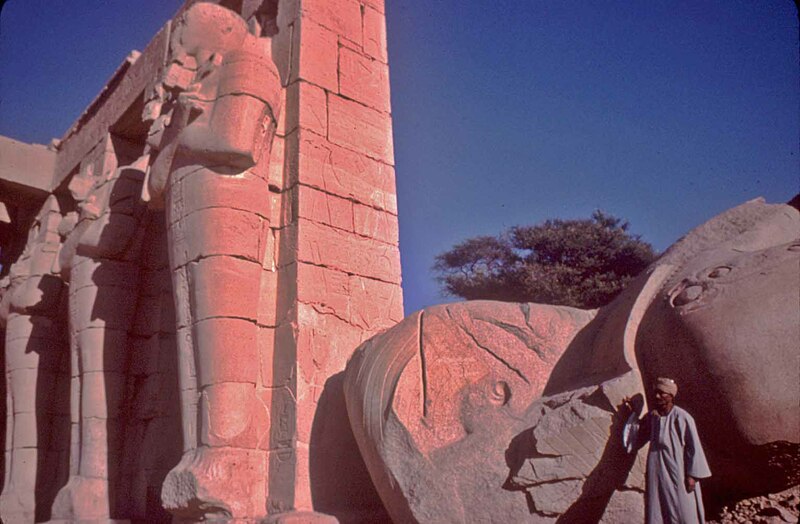 It is believed that this statue must have been at least 17 metres high and have weighed more than a thousand tonnes. The decoration of the temple again shows the exploits of the pharaoh who stopped the Hittite advance. However there are also scenes depicting the festivities held in the first month of summer to honour Min, the prehistoric god of fertility, in whose honour the Pharaoh had to sacrifice a white bull. Another unusual and interesting decoration is that on one of the walls of the hypostyle hall. The sons and daughters of Ramses are shown in two files lined up according to the order of succession. In eighteenth position is Mineptah who in fact succeeded Ramses II on the Egyptian throne.